Hollywood legend Elizabeth Taylor will be remembered for many things: her stunning violet eyes, her multiple marriages, her film accomplishments, and the success of her perfume and jewelry businesses. But Ms. Taylor may be remembered most of all for her philanthropy, especially relating to the fight to find a cure for AIDS and to end discrimination against those afflicted. Much of the Oscar-winning actress’ wealth, which could top $1 billion, is expected to be distributed to charities, including the three charitable foundations she helped create – the National AIDS Research Foundation, the American Foundation for AIDS Research, better known as “AMFAR,” and the Elizabeth Taylor AIDS Foundation. Many commentators expect the bulk of the proceeds from the auction of her jewelry collection, expected to top $150 million, to go directly to these three charitable organizations. Most commentators speculate that the residual of her trust assets will be distributed among her four children and many grandchildren, with whom she had good relations. The exact terms of Taylor’s estate plan are unknown because she used a trust as her primary estate planning document, rather than a Will. Because a Will requires a probate administration, its terms become public record. Many people prefer to use trusts as their primary estate planning document because of the privacy it offers by avoiding the probate process. Taylor’s AIDS work saw her address the General Assembly at the United Nations. She was a huge supporter of Ryan White, the 18-year-old who died of the disease in 1990 after attracting a frenzy of media attention when he was expelled from his middle school because of the disease, which he contracted from a blood treatment for his hemophilia. At a time when AIDS was poorly understood by the world, Ryan helped reduce stigma and raise awareness. Over the last twenty years, Ms. Taylor worked tirelessly to fundraise and reduce the stigma that surrounds AIDS, and was honored by a plethora of organizations that recognized her commitment to the cause. She was presented with the Jean Hersholt Humanitarian Award by the Academy of Motion Picture Arts and Sciences (“AMPAS”), the Marion Anderson Award, the Vanguard Award by the Gay and Lesbian Alliance Against Defamation (“GLAAD”), and she was honored by the Women’s Image Network. Other honors she received include the French Legion of Honor, the Presidential Citizens Medal, and being made Dame Commander of the Order of the British Empire. The portion of Taylor’s estate paid to charity will NOT be subject to estate tax. Any portion of her estate over the amount that can pass free of estate tax, currently $5 million, may be distributed to her children and grandchildren and will be subject to estate tax and possibly GST tax. Given the size of her estate, the estate tax could be in the millions of dollars. For persons who are charitably inclined like Elizabeth Taylor, there are various planning strategies available that both reduce estate and GST taxes and provide funds to worthwhile causes. Outright gifts to charity, both during life and at death, reduce the estate by the amount gifted to the charity. Depending on the law at the time of the death of the donor, the amount of estate taxes saved may be as much as 55% of the amount given to the charities. If the individual wants to retain some control regarding how the funds are to be used, he or she can make a gift to a donor advised fund at an established charitable organization. Even greater control can be retained over the use of the funds through the establishment of a charitable foundation by the donor, either during life (as Elizabeth Taylor did) or upon the donor’s death. Two additional planning options, a charitable gift annuity and a charitable remainder trust, allow the donor to gift money or property to a charity while retaining a stream of payments for a term of years (not to exceed twenty years) or the life or lives of one or more individuals. The value of the charitable gift (and thus the amount of the charitable deduction for income and estate tax purposes) using these planning options is the present value of the remainder gift to the charity. The payment stream retained by the donor remains a part of the donor’s estate, unless expended during the donor’s lifetime. Another planning strategy, a charitable lead trust, is basically the opposite of a charitable remainder trust. Payments are made to the charity for a period of years, with the remainder at the end of that period passing to designated beneficiaries, usually the children of the donor. The value of the charitable gift using this planning option is the present value of the payment stream made to the charity. In certain circumstances, it may be appropriate to combine the use of these various charitable planning strategies with the purchase of a life insurance policy through an irrevocable life insurance trust. This wealth replacement strategy allows the amount of the death benefit from the life insurance to be paid income and estate tax-free to the designated beneficiaries, usually children and grandchildren of the donor, as a substitute for the funds that were given to the charity. 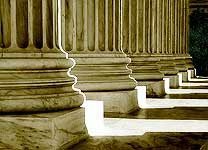 Our law firm focuses its practice on estate planning and administration, including the use of various advanced estate planning strategies, such as irrevocable life insurance trusts and charitable gifting through outright gifts, charitable foundations, gift annuities, charitable remainder trusts, and charitable lead trusts. As a member of the exclusive nationwide group of estate planning attorneys, the American Academy of Estate Planning Attorneys, we are kept current on new laws and other developments, as well as both new and tried and true advanced planning strategies. You may call our office to schedule a complimentary appointment to discuss the estate planning needs of your clients.